Earn up to 17,600 reward points. Accurate recreation of a legend. The name says it all. First introduced by Neve in 1970 it has been reproduced by many others since then, most notably BAE Audio and AMS-Neve. Heritage Audio is proud to introduce what is quite possibly the most historically accurate reproduction ever made. 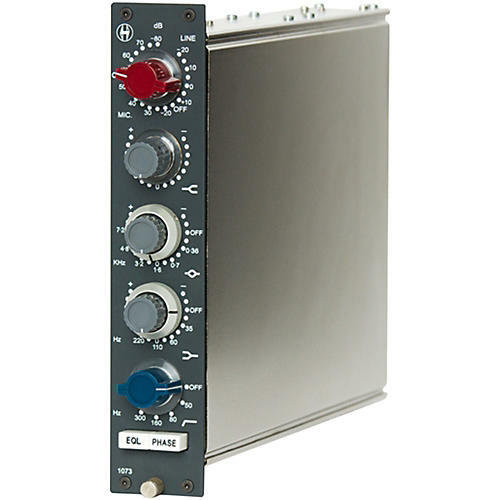 Using the same exact components, specifications and, equally important, same time consuming construction techniques, the Heritage Audio 1073 looks and sounds as good as a Rupert Neve era 1073 module, and will last as long. High Pass Filter: 18dB per octave slope, switchable between 50Hz, 80Hz , 160 Hz & 300Hz, inductor based. Microphone input impedance: HI, 1200 Ohm minimum, LO, 300 Ohm minimum. Higher gain positions gradually have greater impedances, optimum for lo gain ribbon mics. Input is transformer balanced and floating. Maximum output: Greater than +26dBm into 600 Ohms, greater than +32dBu into 10KOhms. Power consumption: 106 mA @24VDC.